Just a while ago, Elminster’s Forgotten Realms was released. It’s a great, well written sourcebook. It’s ‘crunch’ free, and written by the guy who created the setting, Ed Greenwood. But aside from all those things – it’s a signal. Not only is it edition-free, but it’s also the first new Dungeons and Dragons release that bears a difference in cover style and layout design. Put that and the upcoming product page on the WotC website together and you have this equation. Fourth edition is done. Over. That’s it folks. Sad, isn’t it? In a way, I feel really nostalgic, but I also feel like I took a lot out of fourth. More than I ever thought I would. I played in a campaign spanning nine levels and DM’ed one that took my players all the way from one to seventeen, ran countless seasons of DnD Encounters (actually, they are very much countable) and quite a few one-shots. But it’s time to move on to other things, new and old, and Elminster’s Forgotten Realms should pave the way and bring us back to a style of DnD much forgotten but not at all lost. It’s a style steeped in detail and lore and, frankly, I couldn’t think of a better book to guide us on our path. I want to thank Wizards of the Coast Europe for sending me all the wonderful material to review, and I was going to originally post a review of the 3.5 Premium Reprints, and then review this book, but I’ve done that mistake where I opened a book and got so absorbed that I couldn’t put it down. Unlike any other roleplaying game sourcebook, I read this cover to cover. Mostly because I wanted to immerse myself in it and take everything it had to offer. I think that anyone who has listened, watched or actually met Ed Greenwood knows that the man does not live on this planet anymore. He has written Forgotten Realms for decades and after reading this I’m more than ever convinced that he sees, breathes, eats and lives Forgotten Realms. The man is there, telling us all about it through extended sending rituals. Some sourcebooks I’ve read try to take on an observer’s view point, but this is not quite the same. Ed Greenwood is not just an observer, he is an undeniable part of his imaginary world. The book is split into six six chapters: Life in the Realms, Laws and Orders, Hearth and Home, Money Matters, Gods and Followers and The Art. Each chapter goes into various aspects of living in Faerun, and it delves so deep into the nitty gritty and mundane, that the mundane becomes fascinating. Whether it’s Cormyrian fashion you’re interested in, or an actual recipe for Baked Stirge on Toast – you’ll find it. Naturally, the book has a slant towards the adventuring career, as, after all, that’s what most player characters are. When every player read every rulebook, “module”, and The Dragon issue, all too often every last spell, magic item, and monster would be part of players’ metagame knowledge. So, drown them in too much Realmslore for anyone to keep track of – and presto, it’s real roleplaying time again. And I think, personally, that’s what I’ve really missed. Real roleplaying time. I’ve missed books that delve deep into lore and don’t let you go and Elminster’s Forgotten Realms is definitely it. What I want, I think, is for anyone who’s ever played fourth edition to pick up this book. And not just pick it up – read it. It brought me back to when I was twelve years old and read Lord of the Rings for the first time and got completely overwhelmed with that wonderful world. It’s the same feeling here. It’s overwhelming – in a good way. Curse of Undeath is yet another installment in the wonderful miniature-skirmish-card game from Wizards of the Coast. Readers of my blog know that I have a lot of love for this game, and it comes as no surprise that I’m doing a review for this. I’d like to change things up a bit though and not just review the product but also talk about some strategy and share some of the experience that I’ve accumulated whilst playing Dungeon Command. November has been a crazy month with various tournaments and conventions so I barely had time to sit down and play with this new box, but what I’ve seen so far pleases me. All of the boxes we’ve seen have been thematic and I expect this trend to continue. The theme extends into the art, card mechanics and inbuilt strategy all the way to what’s depicted on the tiles. The set oozes undeath and that’s how it should be. One of my friends pointed out earlier on when the game was just released that the ‘undead one’ will definitely feature some sort of a re-animation mechanic and he was spot on – zombies can come back from the figuratively dead. Although if I were honest, I was really wishing for an order card that would let you resurrect any miniature. This sort of card would be very powerful but there can always be drawbacks. The miniatures are, as usual, lovely. I think in terms of sculpt quality, cool factor and paint job, these are easily the best out of the four sets. The skeletons come carrying axes but otherwise look exactly like the ones from Lords of Madness, which I think is a really cool touch. It’s a model that everyone liked but they’ve added a little variety to it and now your DnD game can feature an army of skeletons with different weapons. And to spruce up that army you also get another skeleton – with four arms and four swords and also a skeletal lancer on a horse. The other minies round out the undead theme with zombies, vampires, spirits and necromancers. Oh and let’s not forget the Dracolich. The set focuses on Constitution as the main attribute. The undead are hardy and tough to kill – just as they should be. Every monster is iconically represented in the rules – a vampire will sap life, a zombie will come back from the dead, and a spirit will phase through walls. There is enough variety in the box to bring out various strategies and plenty of ideas for unique custom warbands. Speaking of which, I’d like to talk some strategy. Many have drawn similarities to this game with Magic: the Gathering and I have to agree. Just looking at making custom warbands makes you realise that you probably have to quickly abandon the idea of a ragtag army of various miniatures and if you really want to play this game competitively – invest in some multiples. Whether it’s buying a second (or third, or fourth) box, or just getting singles from eBay, the fact of the matter is – it has to be done. One box is just not enough. Of course, if you’re not planning to play competitively and just want to play this game with some friends on your kitchen table – that’s fine. One box is probably all you need. This warband is all about the Feral Troll. His regenerative ability plus an insane amount of hitpoints make this guy a powerhouse to be feared and respected. He is also level 5 STR and CON, which means that he can land Killing Strike after Killing Strike for those 100 points of damage all day long. You want to play Level Up on him as soon as possible and surround him with Dwarven Defenders. Don’t underestimate these guys. Whilst Dragon Knight is the only card that innately benefits from their Shield Block ability, there are four Level Ups in the order deck to make anyone an adventurer. I was toying with the idea of swapping the Defenders with Clerics, but clerics can only heal once per turn. Our army size is always going to be small and we are likely to have multiple hits on one target during the same round. The Defenders just shrug more damage. The Dragon Knight is a good replacement for when you can’t find a Feral Troll. He doesn’t have regen but he hits just a bit harder and is also level 5 STR and CON, meaning he can play any card in our order deck. The rest of the cast are support actors. The Vampire Stalker is a hardy guy who can deal some decent damage and the Skeletal Tomb Guardian is a wonderful response to being swarmed by a lot of guys. Some cards in the deck are really self explanatory. I went with a three-of of Feral Vitality and Invigorating Smash to counterbalance bad draws. Whilst Invigorating Smash is easily better, only 8 of our 16 creatures can play the card. Feral Vitality is only inaccessible to the Dwarven Defenders. Mortal Wound is a great trick paired with Undaunted Surge. Talking of Undaunted Surge, this is one tricky card. On the one hand, you’ll want to hold on to it, to play it at an appropriate time to maximize on the effect. However, with creatures staying alive for so long, it makes sense to play it early and stack up on those damage bonuses, especially if you can untap your guys with Daring Attack. The only thing I’m not entirely sure about in the warband is the commander itself. Her ability to cycle through the order deck is very important because you want to find that Level Up as soon as possible. However, the very small creature hand leaves something to be desired. I’m not sure how the warband plays out with another commander but I’ve been lucky with Rhynseera so far. Your ideal starting hand is a single Dwarven Defender and a Dragon Knight or Feral Troll. Play both of them on turn one and let them hang out or collect some treasure. Your enemies won’t be able to reach you just yet. Pair them up and play defensively. You might lose out on some early treasure using this strategy but don’t let it bother you too much. Build up your leadership and then dish out the pain. 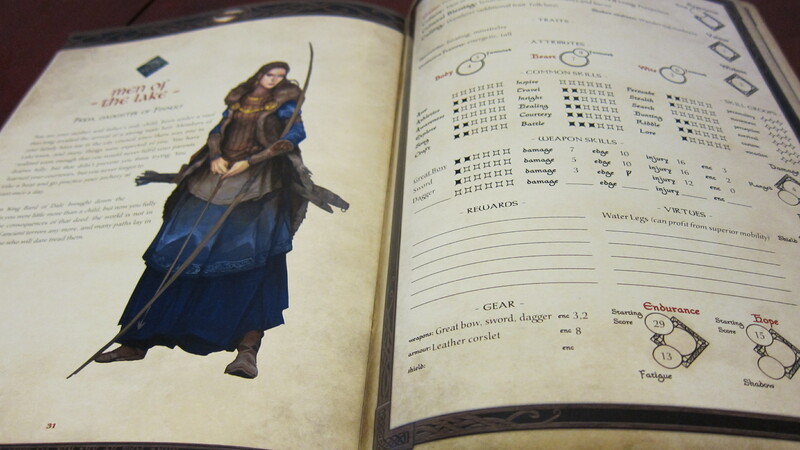 The One Ring roleplaying game is currently in my list of favorite games. I’ve recently ran a mini campaign in my FLGS, Chaos City Comics to a lot of success and after the current season of DnD Encounters is complete we are looking to possibly resume it. What I really like about The One Ring is that, in essence, it is a narrative driven game, but provides a few rules for character customization and advancement to make it interesting to those of us who still like to spend countless hours slaying monsters in dungeons. 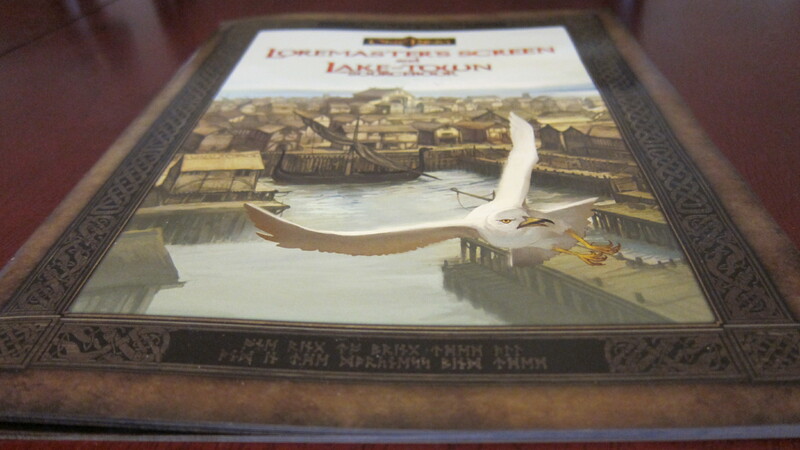 Loremaster’s Screen and the Lake-Town Sourcebook is a double packaged product that provides exactly what it says on the tin. The game isn’t without it’s faults (but what game is?). And it might seem strange to release two diverse products packaged into one. What if I don’t want the screen? Or I’m not that bothered about the sourcebook? Well, to be honest, both are needed. As someone who’s run the game before, having these in my hands feels kind of like a relief. For one, The One Ring is a narrative heavy game but within itself doesn’t include a lot of information on how to build narratives for GMs. Yes, the Loremaster’s Book has some general information on locales, movers and shakers and the world history. But when it comes to specifics the game is lacking. There are many locations within the world like Dale, Woodland Hall or Esgaroth, the Lake-Town itself, but none are thoroughly detailed. Whilst this is really not a problem for someone who’s heavy on Tolkien lore, I myself know very little in comparison. I’ve seen the films, I’ve read the books a few times (ages ago), and I stared at the Silmarillion very hard in hopes of penetrating it with my mind. Still I found myself clearly in need of information about the inner workings of locales. It’s not a detrimental problem as all it takes is a bit of creativity on one’s part. But sometimes it’s just nice to open up a book and let it do all the hard work for you. 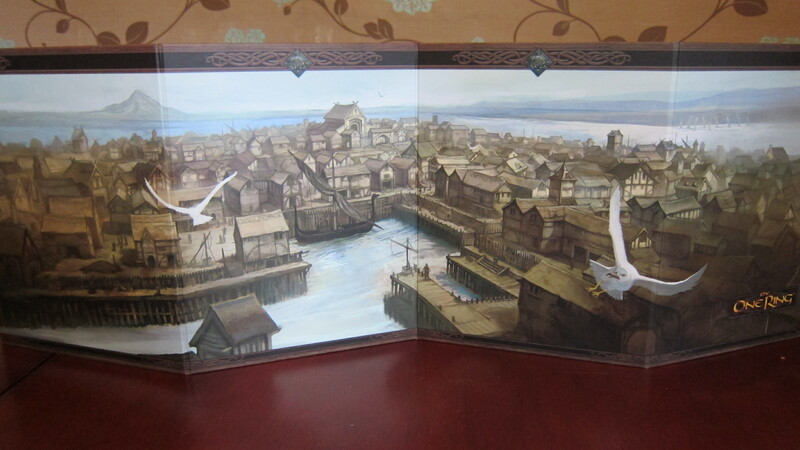 And this is exactly what the Lake-Town Sourcebook does. And then some. 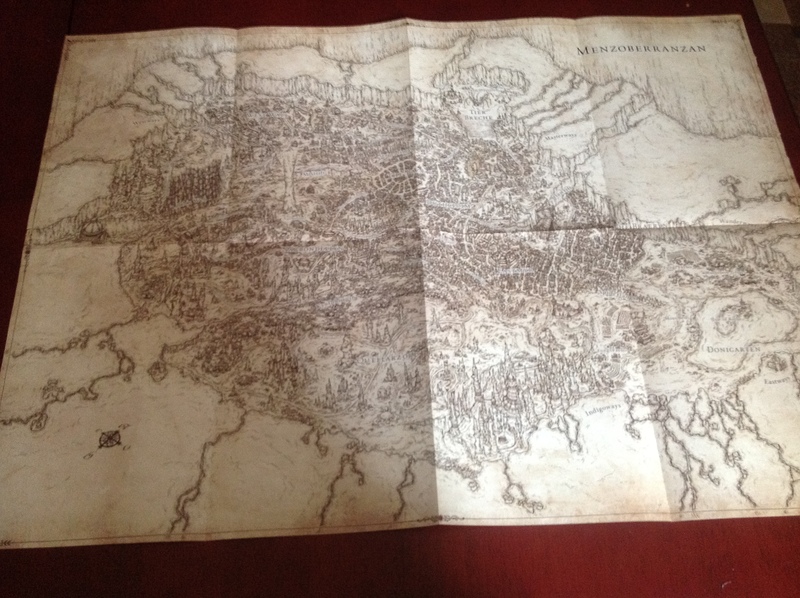 We get a lovely detailed map of the city, with various locations marked on the map with numbers. 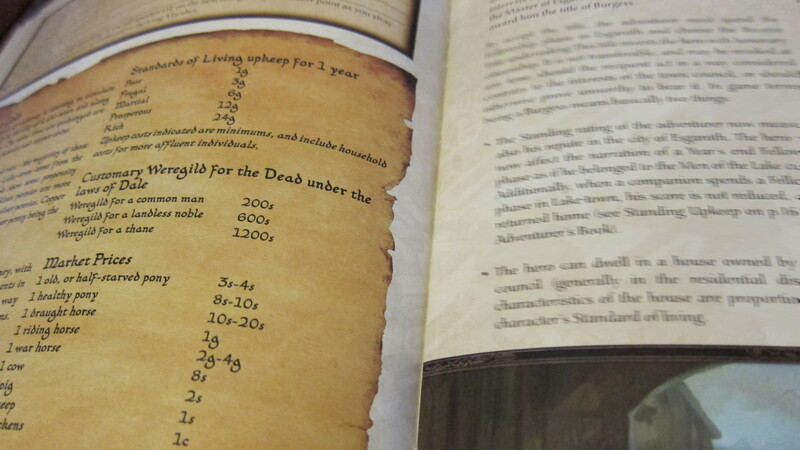 Those numbers are then referenced within the text, describing the places of interest. The descriptions themselves provide pretty much what you would expect, some detail on the visuals and information on various NPCs that you might find and relevant mini stat blocks with a few skills per character type. The book then proceeds to offer various other little fixes to the game. The one thing my players were always confused about was treasure. The problem for them was not only that it wasn’t tangible (it’s literally just measured in points of treasure), but that there wasn’t that much to do with it. I understand why it’s been written like that. The focus of the game shouldn’t be on monetary gain. The type of characters played in The One Ring are all bold heroes that put material wealth behind them. But I would argue though that it would need to be either removed altogether or given some purpose. To my delight, there’s not only a system that converts treasure points into a form of currency, but also provides new fellowship phase undertakings (for those unfamiliar with the fellowship phase, it’s meant to represent downtime between adventures and allows you to improve your character) that enables you to spend the treasure within the market to purchase items that improve certain skills, which have otherwise been very difficult to improve. The sourcebook isn’t all patches though. For such a small book there’s a wealth of material and exciting additions to the game. First of all we get a new culture, The Men of the Lake, which itself is a derivative of the Bardings. There’s also cultural rewards and virtues to accompany the new ‘race’, providing some neat abilities for various types of characters. We also get some information on the Day of the Black Arrow, an archery event meant to honor Bard the Dragonslayer. A chunk of the book is devoted to this event and rules are presented on how to GM this specific archery competition with various skill challenges. 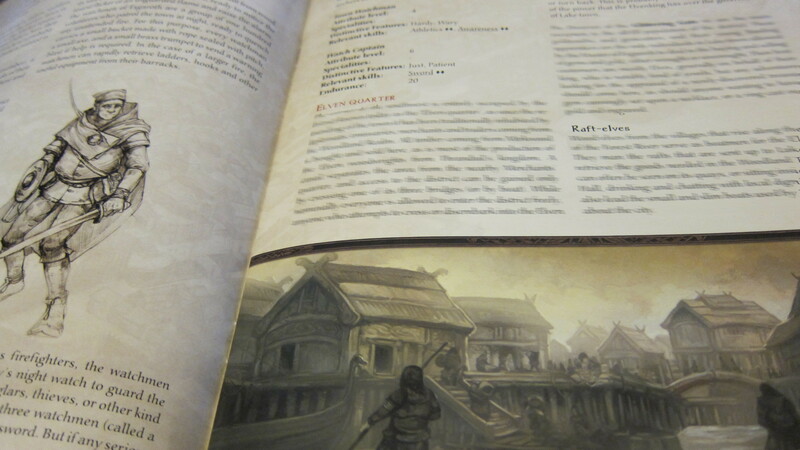 A fellowship undertaking of herb gathering in the marshes will allow access to various herbs described in the book, with potential bonuses that aid the party. For the adventurers who like to stray too far into the marshes three new monsters appearing in the booklet might pose a big threat, including a hulking Marsh-ogre, who’s mangle ability allows him to hit twice. The book is finished off with a sample player character belonging to the new culture, and a blank character sheet with the Lake-men specifics pre-filled. The screen is beautiful. That’s it. It’s just gorgeous. Oh, that’s not enough you say? What’s behind the screen you say? Well, EVERYTHING. Everything is behind the screen. Every little rule thing that you couldn’t remember before is there. From healing, to roleplaying, to monster abilites, to corruption tests. Rules for combat. It’s all there. I can see this screen simply becoming invaluable. I have a love-hate relationship with them as I hate having a barrier between me and my players. But this is just so useful, barriers-be-damned. The quality of the manufacturing is great; the cardboard is possibly the sturdiest I’ve encountered in a screen. Overall, I’m very pleased with the product because it addresses all the little issues that have been nagging me since I started GMing The One Ring. This is clear evidence that the people at Cubicle 7 listen to their players’ concerns and provide answers. Which is all anyone could ask for from a games publishing company. 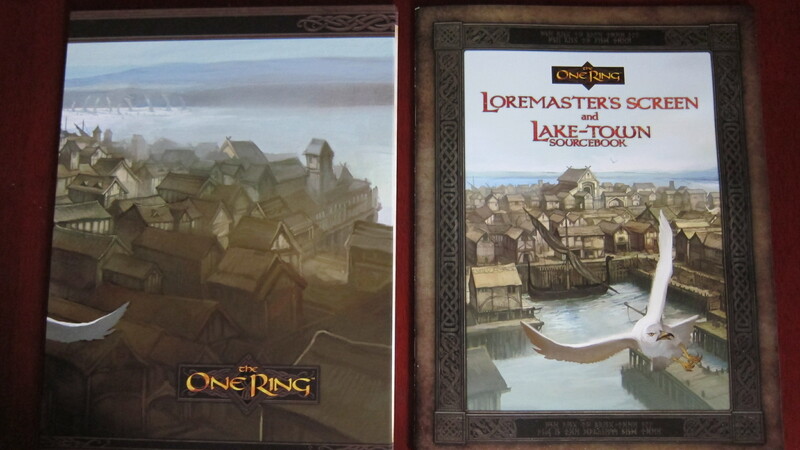 I can’t wait to find out what’s in store for The One Ring in the future and highly recommend the Loremaster’s Screen and Lake-Town Sourcebook. p.s. To those of you who do own the game (or are looking at owning it), here are a few handy links that you might have not yet discovered. There’s a thread on the Cubicle 7 forum that combines a lot of useful information + fan made content. Definitely worth checking out. It’s been a few weeks since GenCon, and I don’t know how about you, but I’m still trying to figure out how the big news has affected me. It was 12am here when the keynote was supposed to start, but with inevitable delays it was closer to 00:30am. Me and a few buddies where huddled at our respective PC screens, chatting over Steam, wondering what the big announcement was going to be. And then it came. No, not Ed Greenwood announcing a series of novels that will reboot Forgotten Realms, nor the confirmation that the default campaign setting will indeed be Forgotten Realms (although important in its own right). And no, it wasn’t the addition of two new classes to the DnD Next playtest. It came matter-of-factly, as if not really that important. A kind of ‘oh and by the way’ thing, uttered by Mike Mearls. It’s going to be two years until they publish DnD Next. Believe it or not, this fact, might even influence our day to day lives. Some of us run campaigns, they last years. We play them every week. A new edition release date is seen by many as a good day to aim to end a campaign at. So that statement kind of makes a difference. Specifically, I know now I have two years in which I could run a campaign, start to finish, and still make it in time for the new edition. Oh look, WotC have released a campaign book, how convenient. Sorry, I’m not really being sarcastic, it makes perfect sense. 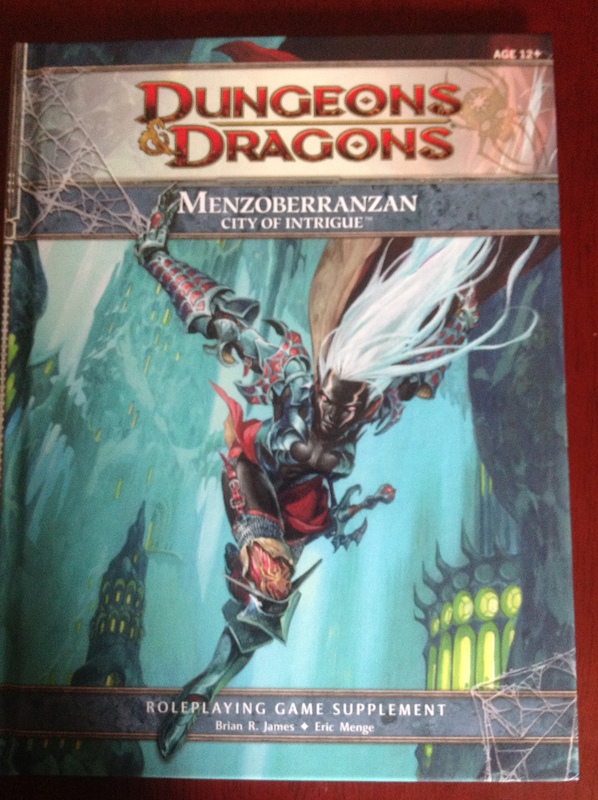 Menzoberranzan has quite a few things going for it, and it is in fact good enough to make me consider using it as a basis for my next DnD campaign. So what’s inside that’s making me like it? This. Yes, this. I mean, I know we’ve come to expect a large poster map in our campaign books but oh how do I love the maps that WotC makes. It’s gorgeous all over, and I don’t think I need to say anything more about it. Oh wait, there’s another side to it! Effectively a color version of the first one, it comes with location markers that point to certain places within the book, becoming a handy reference for the DM or players. But it’s not just aesthetics, it’s the content that shines as well. 4th edition books seemed to have this thing where they were completely oblivious to the existence of previous editions. Yes, they would re-use material from them but only as a recycled kind of thing. Even the Forgotten Realms book was deliberately vague on past events. Finally, Menzoberranzan embraces all the Forgotten history of the Realms (see what I did there? Eh? Eh?) and, for example, events that happened during the Time of Troubles see a lot of discussion, not just the post-Spellplague stuff. I am aware that this is due to an internal shift of how WotC are going to approach DnD lore material and I am very happy about this. Whilst there is a chapter on playing Drow and choosing your house and creating a good background, this book shouldn’t be mistaken for anything else but a DM tool. Almost all of the recent DnD books, even the DM ones have recently featured themes, and this is not the case now. Which is a good thing I believe, there is enough theme support through Dragon magazine and the previous sourcebook, Into the Unknown. This way the supplement gets to stay on focus and provide enough material to spark DM creativity. I was mostly impressed with the information on all the Drow houses. There’s a table on how they interact with each other and how high they have ranked over various periods of history. Don’t like the current houses? Twist and shape FR history and make your own with a section that’s focused solely on that. But then every house gets royal treatment with a good amount of information provided on them, including membership numbers, strength, affiliation, rivals, outlook, beliefs – anything you’d ever need to know about them. 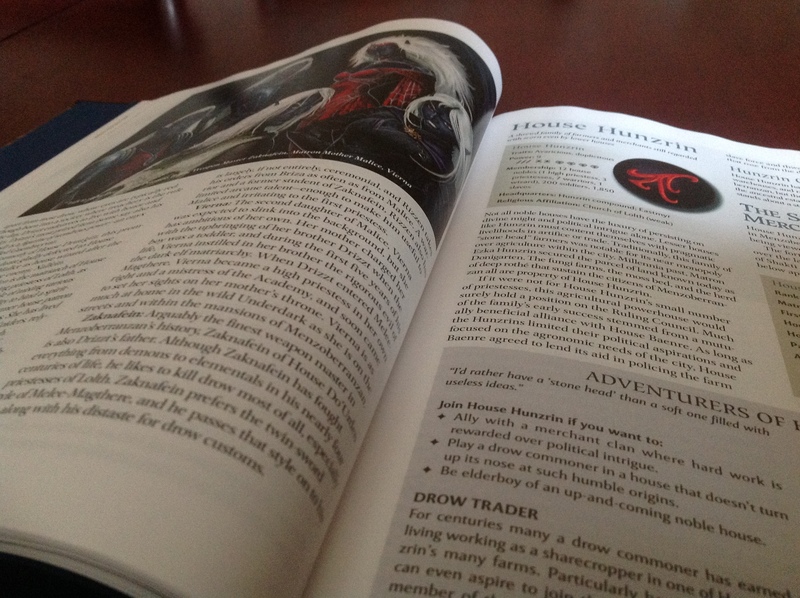 The book treats the Drow houses as campaign factions, suggesting to include three in the forefront of your game for a good amount of intrigue. But why stop there? Include seven and you’ve got a Drow version of Game of Thrones going in your living room once every week, as long as you think you and your players can juggle the amount of information. Geography takes up as much space in the sourcebook as the factions, and I am happy to say that it’s written just as well as in any previous WotC supplement. Quality is what we’ve come to expect and what we’ve got. In addition to scrutinizing Menzoberranzan itself, it explores the Northdark in detail, providing plenty of locations for your ‘heroes’ to travel and explore. This book goes hand in hand with the Book of Vile Darkness. There’s no escaping the fact that most Drow are evil, and if you’re playing a group of them, chances are that your character is evil too. This book explores how to handle ‘evil’ characters and ‘evil’ campaigns, but the Book of Vile Darkness was written to accommodate a game like that. Having said that, I’d also like to warn some groups about running a game where every character is an evil scheming Drow out to get other players. Make sure all your players are good friends, and understand that you’re all roleplaying, and not bringing your antisocial agendas to the table. It seems like an obvious thing to say, but so many times I’ve seen players who just want to ‘kill’ other characters or wreak havoc. This sort of person spells campaign doom to me. It’s competition time! I’d like to give away a copy of Menzoberranzan: City of Intrigue to my readers. I’d also like to have new readers discover my blog! So I’m giving out one brand new copy of the book to one lucky person who retweets this tweet! I’ll mail the book to any part of the world, free of charge, no ifs no buts. In addition, as a bonus, anyone who subscribes to my blog will be entered into the raffle twice. Good luck! I am finally holding a copy of the Dungeon Survival Handbook in my hands. I’ve been planning to write a review for this since before it came out, however my copy was coming through the post. I won’t bore you with diatribes of just how bad Royal Mail is, I’m sure you all know this, and will instead just tell you that it was very late and move on to the review itself. After having read it, I have this sort of funny feeling about it. I can just about imagine this book yelling at other DnD sourcebooks, “anything you can do, I can do better.” Quality of writing, presentation and content is an ongoing theme. Whilst it is lacking in focus, it excels at execution. I remember first spotting this on the DnD product catalog. There was a vague description that revealed only what I already knew from the title – this book is about dungeons. 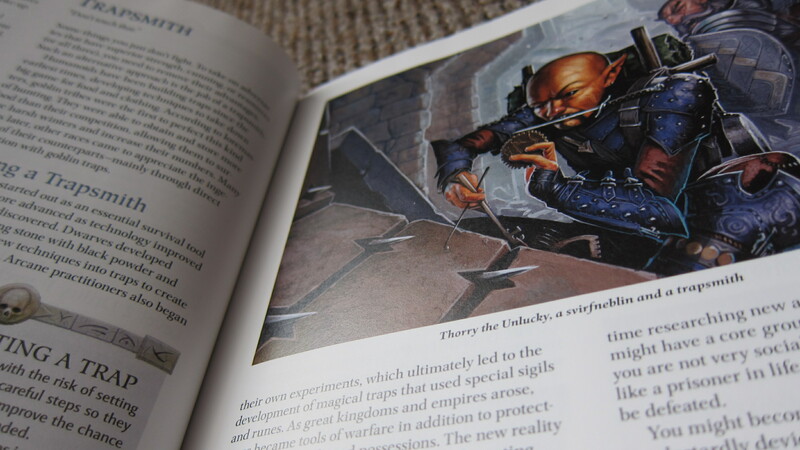 After the previews hit Dragon and Dungeon magazines, I knew there would be six themes and three new races – Kobolds, Goblins and Svirfneblin (someone please teach me how to pronounce this) – but the concept of the book was still shrouded in a veil. Is this targeted for players? Dungeon Masters? It seemed like a player oriented book but I wasn’t sure. Even after reading through it, this feeling still sort of lingers, but I very quickly learned to push it away and simply enjoy the book for what it is. So what is it? Well, it’s a bit of everything really. There are new themes, races, powers, items, locations, monster descriptions, dungeon descriptions and DM tips on how to build dungeons or Underdark campaigns. Sounds like a huge book you say? Not really, it’s pretty much the size of a regular DnD sourcebook. 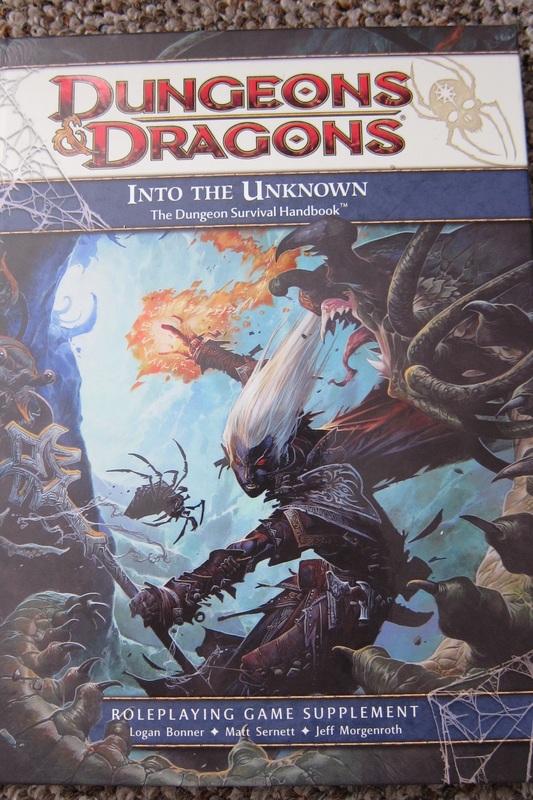 My initial worry was that with so much variety in content, there wouldn’t be enough space for detail, but actually, this is one of the most in-depth fourth edition supplements out there, coupled with great artwork, and a cover laden with spiderwebs, and the Rise of the Underdark logo. The entire book is split into three chapters. The first two are dedicated to players and the third to the DM, although I believe that the DM will find the second chapter just as useful as the players. The first chapter covers the themes, races and new powers. Whilst there are only six themes (Bloodsworn, Trapsmith, Deep Delver, Escaped Thrall and Treasure Hunter), they are covered in great detail and seem to be tailored to the sort of player that wants to make the theme the focus of his or her character. It presents a detailed overview of how such a character would think, act and develop – useful tips and a treasure trove of information for anyone looking for some inspiration. The themes themselves are interesting and tie together well with the new races – who wouldn’t want to play a Kobold Trapsmith Rogue? We also get some sample character backgrounds tied to each theme. Races, like themes, get a better treatment than in any other book before. 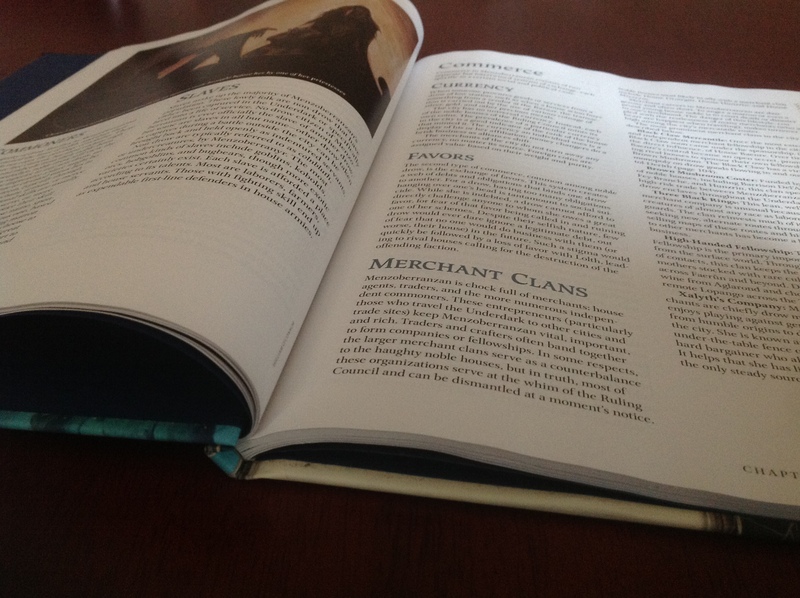 The write-ups are twice the size of the ones in Player’s Handbooks and come with a plethora of racial feats and utility powers – a great way to make sure the races are playable in a game that has so many options already. The racial backgrounds seem to be written in a way that lends itself to some interesting roleplaying opportunities for each other. For example, goblins are greedy and selfish, not understanding the concept of sharing, whilst svirfneblin are communal and always look out for the good of their group. A roleplaying situation waiting to happen. The racial feats are useful and make me want to play the new races. Goblins, for example, can get +1 bonus to damage against anyone larger than them, or can gain combat advantage against anyone who attacks them with a melee attack and misses. 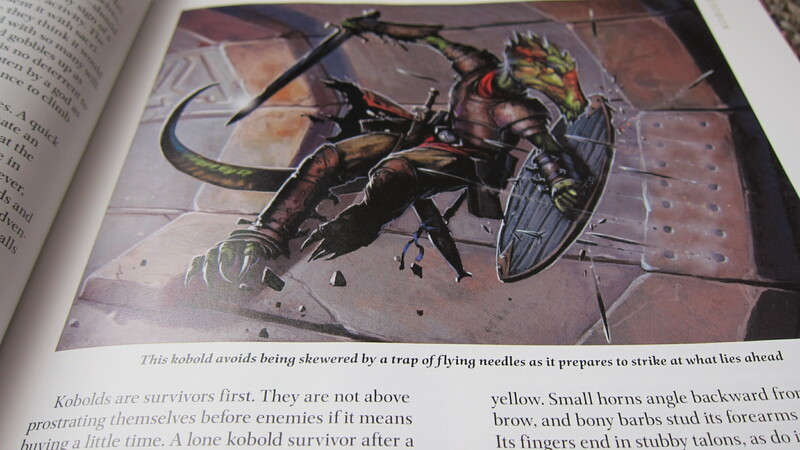 Powers have distinct race specific flavor and names – the Kobold power “Load Slingpot” being a prime example. Finally, I get to roll that D6 as a player, and see if I can hit someone with a gluepot. New powers are tailored around various Underdark organizations, be it the Deep Delvers or Seekers of Lost Lore – every class will find some options here, together with more character background ideas. Chapter Two is devoted to learning about how to survive a dungeon. This chapter feels the most representative of the book’s title. It gives players ideas on how to find secret doors, avoid traps, navigate dangerous terrain, solve puzzles and even explains how certain monsters act – without spoiling the stat blocks. DMs that don’t have much experience will find this just as useful, as it will give them an idea of what to expect from their players and prepare accordingly. The end of the chapter offers some mundane and magical items. Personally, I love mundane items. I feel like 4th edition is over saturated with magic, and sometimes, simple equipment options can lead to better roleplaying, so this is a welcome addition to the adventuring gear list. I’ve only had a brief skim of Chapter Three but I am saving the best for last – I’ve found some great dungeon mastering tips but I won’t spoil them – I couldn’t recommend this book more, just get it yourself and you’ll see how great it is. DnD Next seems to be heading in a direction where dungeoneering will be very important so this supplement will be a great addition to your collection whether you intend to keep playing 4E or move on to Next – the tips in the last chapter are definitely transferable to different editions or even different games. 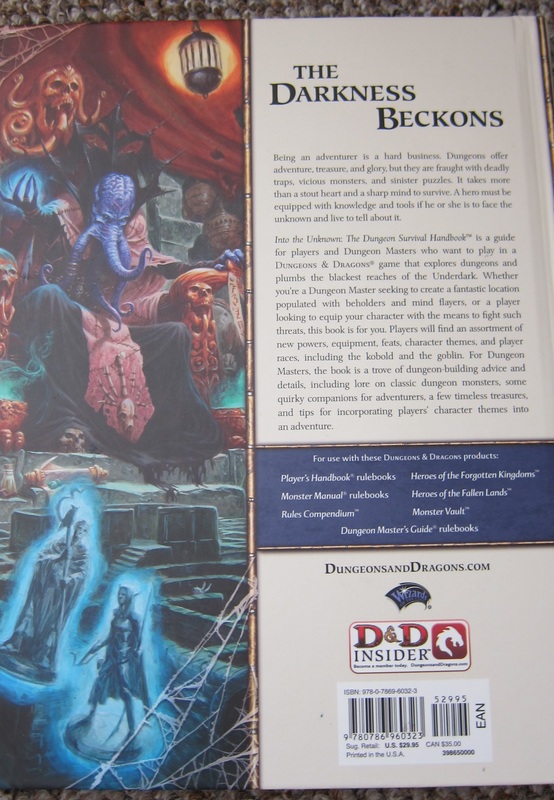 Sidenote: I was very surprised to find mentions, and even images of covers of products from previous editions of DnD. It seemed like fourth edition was avoiding this, but this is a step in the right direction – let the players find out about past products. After all, if they hunt them down on eBay it will only increase their passion for this game!